The Ruidoso New Mexico Bred Yearling Sale say double-digit gains across the board in gross, average and median at their just completed 2018 sale. RUIDOSO DOWNS, NM—AUGUST 19, 2018—The New Mexico-Bred Yearlings and Select Foals in Utero Sale concluded on Saturday night with a continuation of the blockbuster numbers that started during Friday’s opening session. 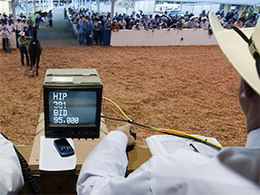 The total sale was up 31-percent per horse sold (final). The quarter horse yearlings over the two nights were up 46-percent per horse sold (final). The thoroughbred yearlings, which all sold on Friday night, were up 54-percent per horse sold (final). The Foals In Utero (18 offerings) were down 31-percent on the small sample (see related story). Javier Rodriguez paid $84,000 for the high-selling Quarter Horse, Hip 253 First Requirement, a First Moonflash half-sister to undefeated 2018 two-time Ruidoso Downs futurity winner Jess Fire Chick ($322,040). Double LL Farms, Agent consigned the brown filly out of the stakes winning Walk Thru Fire mare Required Fire. Tommy Dinwiddie signed a $75,000 ticket for the second high-seller Hip 190 Big Big Love, a colt by leading third-crop sire Big Daddy Cartel from the consignment of Wood Ranch & Racing. Big Big Love is the first foal from the unraced Walk Thru Fire mare out of Ruidoso Derby(G1) winner Remember Me Rose by Corona Cartel. The third high-seller Hip 268 Dark Moon sold for $68,000 to Don Cavenaugh. Double LL Farms, Agent consigned the first foal by leading sire First Moonflash from a winning sister to multiple stakes winner Flare For Ivory by Ivory James. AQHA racing champion Special Phoebe is the second dam. Ted Zrzavy was the sale's leading Quarter Horse buyer with three purchases totaling $115,000. Paul Blanchard had two for $95,000 and Eduardo Mendoza paid $85,000 for four head. Double LL Farms, Agent was the leading Quarter Horse consignor or agent with 51 head grossing $914,900. MJ Farms, Agent sold 39 yearlings for $821,600 and Wood Ranch & Racing had six head for $136,500. Big Daddy Cartel led Quarter Horse sale sires (by average with two or more sold) with 33 head averaging $22,818. First Moonflash had 26 for $21,519 and Chicks Regard sold five yearlings that averaged $20,800. CLICK HERE for preliminary sale results including hip-by-hip prices. The high selling Thoroughbred, an unnamed bay filly that brought $62,000, is a daughter of Attila’s Storm and the stakes-placed Distorted Humor daughter Ritzy Dame. She has produced the stakes-placed Ritzy Lass. A&A Ranch consigned the filly purchased by the partnership of Norman Allen, Joe Dee Brooks, Scott Bryant and Suzanne Kirby. The 2018 Thoroughbred yearling average was $12,677.